My father, Les Spall, was a sergeant major in the Army’s 40 Division during World War II. His best friend was another sergeant, Mel Kenniger, from St. Louis. My dad was from Greeley, Colorado. While on the USS Warhawk, near Corrigidor, their ship was hit by a Japanese kamikaze and Mel was killed. My dad barely escaped, but was injured and received the Purple Heart. He began writing Mel’s fiancé Doyne Kiser. They eventually met, married, and settled in St. Louis, where my sister Linda and I were born and raised. I was named after Mel. I heard many stories over the years about the army, my parents meeting, and life during WW II. My dad was an important employee for the Department of the Army at the St. Louis Military Record Center. My parents went to parties at the officer’s club there. The Army was a significant feature in our lives. When I was a kid, I naturally watched many war movies and played “army” with my friends, or with military toys in my bed room. Sometimes I painted the green arm men to make them look more real. I wore my dad’s old army shirts and hats with pride, and one time he brought home a colonel’s hat for me. (when they went from brown to green) We had a South Korean general over for dinner one night when I was a teenager in Kirkwood, Missouri. I saw myself as becoming a career army man, and wished I could go to West Point. I went to Concordia Lutheran elementary school and later to Lutheran High School South. I was not a good student, and soon realized I would never get into West Point. My teachers were generous with me, but my grades were at best average. I was a successful clarinet player and enjoyed the band at South. I dated several girls and eventually met Susan, one of the few highlights for me of high school. Upon graduation from high school I went to a Lutheran teachers college. I realized that teaching was not for me and since it was 1968, the world outside became a more attractive place than school. There were war protests, assassinations, civil rights marches, etc. Also during this time, my cousin Darrell Taylor was fighting with the 25th Division in Vietnam, and writing letters to my family. He was severely wounded and received a Silver Star for his bravery. Knowing this, and watching the Vietnam War death counts and military action every night on the news, I decided that I belonged with those courageous men (boys) fighting over there. I felt like a failure at home since I didn’t like school and I had no career goals other than the old feeling that I might be successful in the military. Beside this, I was sure to get drafted if I dropped out of school. 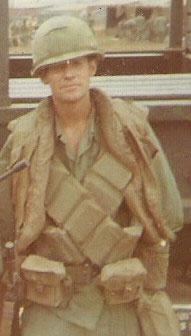 I enlisted and began my active duty on February 27, 1969. I had previously gone for my physical and found healthy, so I had no anxiety about the entrance physical. I never was much of an athlete, so I knew the training would be difficult, yet doable. Joining was not a popular decision with my family or Susan, but I said I would only be a couple hours away at Fort Leonard Wood and will get passes. Of course after I was there a couple of days, they flew us out to Fort Ord, near Monterey, California. As a trainee, I did alright. Basic was challenging, but I did well generally. I found I was particularly good with an M-14 rifle and qualified expert. (got a little badge) When I hurt my hand, requiring surgery, I missed a couple of weeks of Basic and it delayed my orders for AIT. I thought I had signed up for OCS (Officer Candidate School) but never heard from it. That, my rifle expertise, and who knows what else, possibly landed me in advance infantry training and I made PFC when I finished. 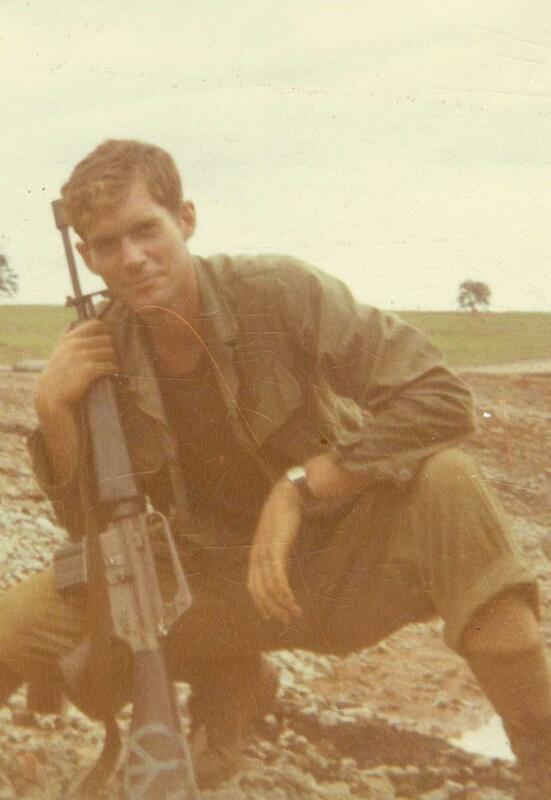 That day, I received orders for Vietnam. During my time between, Susan and I hastily decided we would get married if I made it back. She wrote me nearly every day while I was away, and sent me books to read. She even met me on my R & R in Hawaii. After a teary farewell, I was off to Fort Lewis in Seattle, then across the seas via Alaska, Guam, and landing in Camron Bay on November 10th, 1969. My first impression of Vietnam was that it smelled like garbage left too long in the kitchen waste can. It was hot and humid like a summer day in St. Louis, however, it was late autumn. I was assigned to some barracks and given some “in-country” training about booby traps, ambushes, and generally things to avoid. I also was given my orders to report to the 101st Airborne Division. I thought that was pretty cool, as I was familiar with their fame in WW II and knew their Screaming Eagle patch well. I was assigned to the 3/506 which was a “stand alone” reaction battalion, not attached to the rest of the division at that time, which was farther north near the Ashaw Valley. We were in the central highlands doing bridge patrol outside of Phan Thiet when I arrived. I was in the 1st Platoon, 3rd squad of Charlie Company. Rather than go into details about fire fights, death and destruction, suffice to say it was a scary place. Helicopter assaults are exciting and extremely frightening. (Airmobile) We did several. My nerves were on edge a lot. I think I was more worried about losing a limb than death. I had many close calls, both from friendly and enemy fire, however I was never severely injured. I prayed with great consistency and I am sure that a guardian angel watched over me. Like many who survive war, I wonder why God kept me safe and not others, and for what purpose. I still ask that. My life was on the line every day. The flora and fauna were vastly different than in my back yard in Kirkwood, MO. I soaked myself daily in mosquito repellent, which mostly worked. I still woke up with leaches on me, especially after river crossings or deep in jungle. I was bitten 3 times by a scorpion. I saw wild elephants, panthers, snakes, huge centipedes, monkeys, water buffalos, endured stinging ants, bees, all manner of insects, surprisingly few birds, many plants with thorns, razor grass, extreme heat, rashes, sores, cuts and scrapes, ankle sprains, monsoon rain, little sleep, rats, and commanding officers. You can imagine that alcohol played a big role when we were in the rear area. Managed to get a shower and haircuts. I couldn’t always write letters as circumstances and weather would not allow it, so I caught up on letters. I tried to stay in touch with folks back home, but seriously, what could I write about ? They would send me packages on occasional supply days out in the field, with snacks and cookies inside. My dad sent me some bourbon disguised as a soap bottle for my 21st birthday. (it smelled like soap) We always shared the contents of our packages, not so much that we were that generous, but we didn’t want to carry any more than we had to. Near the end of my tour, I had a chance to visit some guys I knew that were transferred to Da Nang for a couple of days, but I spent the overwhelming amount of time out in the field, mostly the central highland mountains and jungle, until we were attached to the 4th Infantry Division and invaded Cambodia. Things were hot Cambodia. We surprised the enemy several times and recovered many weapons and rice supplies. I brought home a Russian SKS rifle as a souvenir and some binoculars. It was in Cambodia, during a rest from walking point on a trail, that I learned of the death of four students a Kent State University. It was a profound moment for me. I realized that they died because I was in Cambodia. From that moment on, I began to question the war and how I must be perceived by people back home. I knew that there were demonstrations and ROTC burnings, but these deaths were significant. I started to feel that instead of making a positive difference in the war, I was party to unrest and anger back home. It didn’t keep me from doing my best for my comrades sake, but I went into more of a survivor mode as a result. After Cambodia our battalion, known as the Currahees, was re-united with the rest of the 101st up north where we did firebase security and patrolled trails in the Ashaw Valley. Our division had some fierce battles and my platoon lost several men. Then in late October I got the news that I was being pulled out early from my year-long tour. November 9th was my scheduled date, but I was leaving a few weeks early. I had my last helicopter ride back and then was flown to Camron Bay for a flight back home. 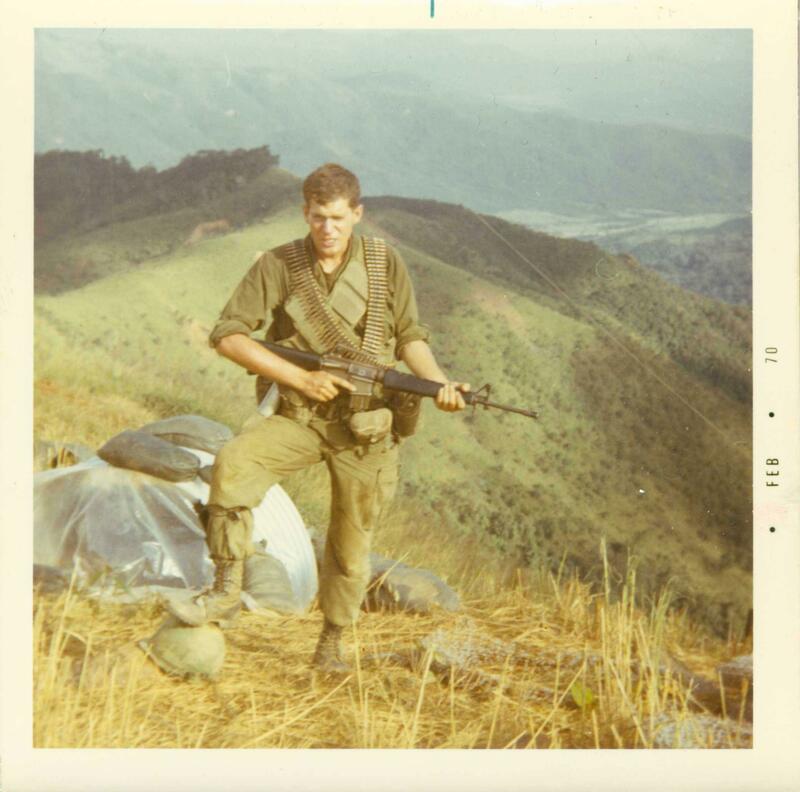 I was discharged from active duty at Fort Lewis, because at that time, if you returned from Vietnam with less than 4 months service remaining, you were not reassigned. (so I only had a total of 20 months active duty) I remember in a classroom, before we all departed, they asked if any of us wanted to become “Air Marshals.” I called Susan in the middle of the night from the San Francisco airport, to say I was on my way. At the St. Louis airport I was met by Susan, her parents, my parents and my sister. It was one of the happiest days of my life. It’s a little sad to think that the only one still alive from that reunion is my sister Linda. When I first lay down in my old bed at home, and closed my eyes, I wondered if it was all a bad dream. Of course, I had the usual symptoms of PTSD, however it was not the issue it is now. I was spooked by loud noises, my senses were still on high alert. I actually had an uncomfortable feeling wondering where my M-16 was. (I had slept with it sitting just above my left shoulder in case of a night attack for a year) Everyone could tell I had changed quite a bit. I don’t think my family knew how to handle the situation, or maybe they did. They didn’t ask a lot of questions. They let me tell what I needed to relate and nothing more. I think my dad was proud of me, as he and I went to by some beer, and after he told the clerk I had just gotten back from Vietnam, the guy gave us a bottle of champagne. I’ll never forget that moment. I went to church with my family that Sunday dressed in my uniform, with all my medals. (bronze star, air medal, commendation medal, etc.) Several people in the congregation were surprised. They thought I was away at the seminary. That was sort of the beginning when I started to notice that people back home were not particularly impressed with the fact that I was in the war. In fact the sentiment was decidedly toward disfavor. I began having trouble relating to old friends, who did everything they could to avoid the draft. Most people I met didn’t know how to treat a veteran of Vietnam, since it became very unpopular. I could tell some thought less of me. One of Susan’s brothers was a conscientious objector. She tried to be understanding. I conformed to the mood of others by saying I was against war, as well. Mostly I kept quiet on the subject. Time went by, and I finished college at SIUE. Got married, mostly because we thought we should. We divorced a few years later. I just couldn’t open up like I should have, largely due to my war experiences. There were other reasons, but that was predominant. I got a job as a probation officer, then later worked at the St. Louis Family Court-Juvenile Division, where I am closing out my career as the Chief Investigator after 42 years of service. I'm a past Commander of Post 525 American Legion, where I've been a member for over 30 years. I spent my divorce years meeting several great women, but wasn’t ready for marriage again until I met Ann Martin at a charity dance. She was the most wonderful and understanding woman I had ever known. We fell in love immediately, but didn’t marry right away. Finally I took the plunge. We have an amazing daughter we call Maddy. She works and lives in Columbia , MO. It has only been recently, after Iraq, and Afghanistan troops began coming home, that I saw people showing respect to veterans. When we came home, many people were angry with the soldiers that fought in the war, even though many were drafted and served against their will. I was not deliberately mistreated, but others were. They were definitely confusing times, and I still hear guys my age bragging about ways they avoided the draft, which always bothers me.